Provide comfort for the family of Edward Terrance with a meaningful gesture of sympathy. AKWESASNE – Edward Roger Terrance, 83, of 427 Cook Road, peacefully passed away in his sleep early Saturday morning, January 12, 2018 in the comfort of his home. Ed was born in Akwesasne on August 23, 1935, the son of the son of the late John P. and Rose M. (Sawatis) Terrance. On April 26, 1958, he married Ann Arquette at St. Patrick’s Catholic Church in Rochester, she predeceased him on June 23, 2015. Ed was an ironworker with Local 33 in Rochester for over 30 years until his retirement. 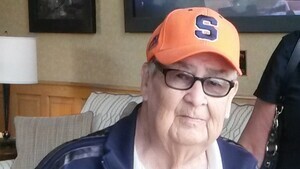 He was a die-hard Syracuse University fan and enjoyed riding his pontoon boat, especially to trips to his camp. Ed greatly enjoyed watching his daughter, Kim play softball and could be found enjoying pull tabs. He also cherished the time he was able to spend with his grandchildren – especially his great grandchildren. Ed is survived by his children, Erica and Mike Oakes, Darman Terrance, and Kim and James Burns, all of Akwesasne; his grandchildren, Brian, Deanne, Devin, Jenna, Alaina, Lindsey, Jason, Stacey, Iorakote, Jimmy, Joe, Tiffany, and Tia; many great grandchildren and 2 great-great grandchildren; his brother, Kenneth Terrance; and many nieces and nephews. In addition to his wife and parents, he was predeceased by a granddaughter, Ashley Gray on June 10, 2015; a great granddaughter, Kennlyn Rayne Oakes-Phillips on September 19, 2013; and his brothers, John “Jack”, Raymond, Ronnie, and Dennis “Pat” Terrance. To send flowers in memory of Edward R. Terrance, please visit our Heartfelt Sympathies Store. Provide comfort for the family of Edward R. Terrance by sending flowers. Im so sorry to hear about the loss of Dear Mr. Edward. It's painful to loss someone we dearly love in death. But we have a great promise written in the scriptures from God that soon we can see our dead loved again. Acts 24:15("And have hope toward God, which they themselves also allow, that there shall be a resurrection of the dead, both of the just and unjust") Psalms 37:29 ("The righteous will possess the earth,And they will live forever on it.") And they will have the hope of everlasting life.So we can see our dead loved ones again and live with them forever.if we continue to get accurate knowledge of God and Jesus. ("This means everlasting life,their taking in knowledge of you,the only true God, and of the one whom you sent forth, Jesus Christ.- John 17:3) I hope and wish these bible promises give you some comfort and peace in this difficult time. I’m so sorry for the loss of this man . My condolences go out to the Terrance Family. There’s a Scripture I wanted to share with you that always comforted me when I lost someone close to me in death. It’s in Revelation 21:4 which says : “And he [God] will wipe out every tear from theur eyes, and death will be no more, neither will mourning nor outcry nor pain be anymore. The former things have passed away.” This is a promise from God that he will end death forever in the future and that we wiii see our dead loved ones again! Kim, Erica and Darman I am do dorry for your loss. Kim you have loss a great fan, it was always nice knowing he was at the field watching you play while you were pitcing.